And the knitting parade continues....See I told you while I was not blogging, I was knitting!! LOL. 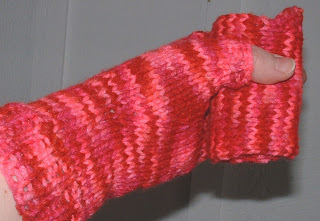 knitter without a pair of handknit mittens?? Comments: They need some sort of embellishment. Any ideas?? 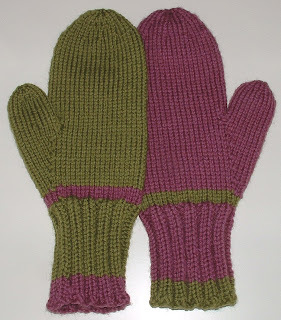 I made a pair of mitts for my mother for Valentine's Day. I liked the colors so much, I made another pair for ME!!! And yes, I used acrylic. I just couldn't leave the yarn in the store. It photographs horrible like all reds....... but trust me..... the color is very cool! Comments: YES, I used acrylic. And I liked it!!!! My mother requested a beret. When I saw this pattern online, I knew it would be perfect! And it was. I wished I had a head that could wear a hat and look cool!!! Comments: This was a fun knit! And finally proof I stil use my jewelry tools!! These were a gift for a fellow knitter! 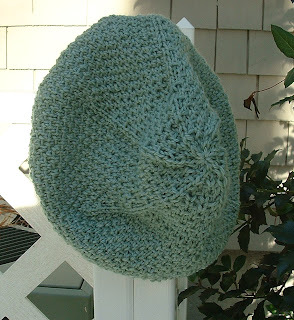 OK, now I think all the "finished" knitting is blogged..... what else am I going to talk about??? Books and movies???? Gardening??? I knew you'd been busy, but WOW!!! I love everything, but especially the purple and green gloves - yummy! Thanks Girl!!! 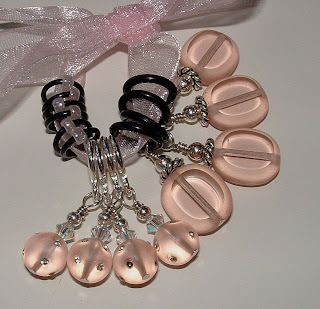 You know, little project s are quick and easy and oh so satisfying...... And I finished up even more this weekend!! LOL. In between raking and yard work!